We are unapologetically fascinated by treasure. We attend movies such as The DaVinci Code, Angels and Demons, the National Treasure Movies, Indiana Jones Series and Pirates of the Caribbean that captivate our imaginations and foster a spirit of discovering treasure of incredible worth. From the archeologist to the modern day treasure hunter to the Saturday morning garage sale addict, we bump into treasure seekers all the time. Who among us has never ripped open a new box of cereal and plumbed the depths of the box looking for the prize at the bottom? All of life is seeking after value. People are fascinated by treasure. Sometimes it comes fortuitously. Some stumble upon it by accident. Sometimes it comes after a long and patient search. However one comes upon it, it is worthwhile. It is treasure. In Matthew 13:44-46 Jesus told two parables about seeking and finding treasure. In these twin parables, Jesus taught that the kingdom of God is valuable beyond estimation. Its value transcends all things and its acquisition merits the loss of all things. What happens when one happens upon the treasure of the Kingdom of God? Like a play, theses parables are laid out in three simple movements. 1. When the treasure of the Kingdom is discovered, the future is immediately and irrevocably changed. The kingdom opens my life to the possibility of new worlds, primarily that I will never be the same again. This is the essence of hope. True hope is not our ability to survive or sustain or even to prosper. True hope lies in the possibility of transformation. Hope does not lie in wishfully thinking that my circumstances can change. Hope lies in the fact that I can change. 2. This discovery causes me to change my present direction. In order to obtain the treasure, I must reverse my present direction and exchange all that I possess. This reversal is the key to the acquisition. No transformation in life is possible without a radical reversal. 3. This reversal allows for new possibilities for action that were not thought possible before. Having been freed from all other restrictions, I am enabled to reach their potential to live as God has intended. The twin parables of the Mustard Seed and the Leaven, found in Matthew 13:31-33, describe the nature of the Kingdom of God. What is the nature of the Kingdom? The initial appearances of the kingdom seem small and insignificant, but result in something large and significant. The seed is the smallest. The small leaven can be hidden. But tiny seeds eventually become big trees and lumps of leaven can affect entire bushels of flour. • Carpenters become Savior of the world. Jesus is teaching us not to be hypnotized by size or appearances. He challenges our assumptions about size. Size can never be the measure of assessing the things of God or the work of God’s kingdom. The seed, though tiny, is still the kingdom of God, and the yeast, though small, is still the kingdom of God. The kingdom is organic, like seed and soil. The seed goes into the soil and it grows and we don’t know how, yet it does. It’s the nature of the seed to grow and become. As the seed is to the soil, the good news of the Kingdom is to your life. The kingdom produces ultimate consequences out of proportion to its insignificant beginnings. This calls for patience, for neither the seed nor the leaven yield instantaneous results. It takes time for the seed to grow and the yeast to rise. These parables are not really about how small things become big. They are about how the seed becomes a tree that overtakes the garden, and how the yeast eventually permeates the entire bushel of flour. The Kingdom consumes our lives. It pushes aside and eventually takes over. The personal struggle we face is that our nature wants to resist the take-over. (cf. Romans 7) As our flesh resists the take-over of the kingdom, we naturally want to make it a sin problem. But the problem is not your sin (or your personality, attitude, circumstances, or environment for that matter). The problem is control. So if the problem is not our sin, the solution is not self-restraint. The solution is surrender. You become what you give yourself to, or who you give yourself to. The kingdom, given time and space, will suffocate the junk in your life to the point that your will become increasingly and reflexively partners with God and his work. It will take over. Anyone who has observed lawns and landscaping is well aware of the ongoing turf battle with weeds. When we moved to Arkansas, we bought a house that had been unoccupied for two years. In a cost cutting move, the builder chose to lay sod around the structure of the house and to seed the rest of the lawn. During those two years, the house had nice, plush grass around its immediate circumference. The rest of the yard was another story. After several estimates we selected a company that came to our home and drenched the soil with weed killer. After the weeds were dead, we had very little grass to compliment our big dirt lawn. Two years later, we were finally in business. Jesus’ second parable of Matthew 13 regards the wheat and the weeds, found in Matthew 13:24-30, 36-43. As the story goes, a farmer planted wheat in his field. Under the cover of darkness, an enemy came to the same field and planted darnel (like ryegrass) among the wheat. During the initial phases of growth, the wheat and the darnel looked the same. But as the grain heads began to set on the wheat, the farmer could quickly discern that everything was not as it seemed. It was popular for some time to read this parable and interpret it as being directed toward people in the church who were not genuine Christians. But Jesus is not addressing this parable to the church. He plainly says, “The field is the world.” The point of the parable is that the Kingdom of God is being sown in tension. God permits the dynamic tension of the Kingdom coming in the midst of an evil world. The presence of evil in no way discounts the arrival of the kingdom or diminishes the work of the kingdom. We should never be surprised at evil and its opposition to the advance of the Kingdom. (Matthew 11:12) The kingdom has come and is at work with limitless grace, but it is not purging the world of evil. The Jews believed that when the Kingdom would arrive under Messiah’s reign, evil would be eliminated. Not so. The good seed of the Kingdom is being sown and is to be fruitful in the midst of evil, not in the absence of evil. As good seed in the Kingdom, we cannot be tolerant of evil. But the elimination of evil is not our task. We are not Christian superheroes with masks and capes efforting to stamp out evil. Many who make their task fighting evil end up becoming evil in the process. On May 31st, 51 year old Scott Roeder walked into a church and murdered renowned abortion doctor George Tiller. When police caught up with Roeder 170 miles later, he surrendered without incident. When Roeder was brought before the judge to enter his plea, he pled “not guilty,” citing that his homicide was justifiable in face of the evil performed by Tiller in his Kansas clinic. As members of the Kingdom we are not fighting evil. God has not delegated that job to us. We are, however, to overcome evil by outshining evil. Evil is overcome by good (Romans 12:9-21). Our job is to be fruitful and to reflect the glory of God in and through our lives (Daniel 12:3). Judgment will someday come where good and evil will be clearly separated. The consummation of the kingdom brings a sifting. The one who sows the seed is also the one who directs the harvest. But this final judgment will not come until the end of the age when evil will be destroyed once for all. The plants are identifiable and distinguishable through their fruit. The farmer knows which is wheat and which is weeds. Members of God’s Kingdom are authenticated by their fruit. The evidence is our fruit, not our words. Fruit is what authenticates your life (Matthew 7:16-23). My wife loves to work in our landscaping. She would consider this one of her hobbies, and she’s very passionate about it. Because she loves working in the flower beds, I get the privilege of helping out. Last week Lisa began working on building another flower bed. Upon its completion we will have completely encircled the house. Before any flowers or plants can be planted, the soil must be prepared. We take our wheelbarrow out into the yard, and begin mixing equal parts of sand, top soil, peat moss, and the natural soil from the bed itself. This is mixed in the wheelbarrow, then dumped into the bed where it is stirred in with the existing soil. In the Parable of the Sower, Jesus described four soil types which represent our reception of the message of the Kingdom. The parable is designed for us to see ourselves and to identify which kind of soil we possess. Which brings us to another question: How do I improve my soil type? How can I increase my responsiveness and fruitfulness? James 1:19-22 gives us three ways we can improve our reception of the message of the Kingdom. Before we can receive the message of the Kingdom, we have to eliminate obstacles. This is not unlike preparing a flower bed by pulling out the rock and debris before adding good soil. James gives us some suggestions as to what kinds of obstacles impede our reception of the word. He mentions anger, filth and evil. I don’t think James is giving an exhaustive listing. He offers some examples of obstacles. Each of us would do well to consider the things in our lives that get in the way of our hearing and work to eliminate them. Our relationship to the word is important. Every day we are either “under” the word or “over” the word. By this I mean we either approach the word with humility, placing ourselves under its authority, or we approach the word with pride, placing ourselves above its authority. In my Baptist tradition I have always admired the fact that we as Baptists are “people of the book,” and that our high view of Scripture enables us to see the Scripture as our authority for faith and practice. 3. ACT, or RESPOND. “But don’t just listen to God’s word. You must do what it says” (James 1:22). Once obstacles are removed and we receive the word with humility, we must act upon what the message calls for us to do. James continues, “For if you listen to the word and don’t obey, it is like glancing at your face in a mirror. You see yourself, walk away, and forget what you look like. But if you look carefully into the perfect law that sets you free, and if you do what it says and don’t forget what you heard, then God will bless you for what you do” (James 1:23-25). In the Parable of the Sower, one discovers that the farmer is the same and the seed is the same. The soil is the difference, which becomes the focal point of the story. In Jesus’ interpretation of the parable in Matthew 13:18-23, he plainly describes the four soils which are distinguished based on their reception of the seed. The focus is not the message, but the reception of the message. Furthermore, the one message of the Kingdom can have varying degrees of impact. The first soil type is RESISTENT. It is the footpath which has become hard and unresponsive. The resistant soil is unresponsive because it “does not understand” the message of the Kingdom. The dormant seed is quickly snatched away by the enemy. The second soil type is described as rocky or SHALLOW. This soil receives the message of the Kingdom with enthusiasm and joy, but because it lacks depth the initial enthusiasm is dimmed at the first sight of adversity or persecution. Because of its lack of depth, the small plant gives up. Yet a third soil type is the DISTRACTED soil…characterized by thorn infested. While the seed finds enough soil to take root, it finds itself overcrowded with distractions. Apparently there are multiple trust issues, as the soil is cluttered with the worries of life and the lure of wealth. The seed is perhaps initially intrigued by the message of the Kingdom, but only insomuch as Jesus becomes an “add on” or an upgrade to a complicated life. But the gospel is not an add on. The message of the Kingdom is intended as the organizing and ordering principle of one’s life. If we pause for a moment to evaluate the first three soils, we quickly observe that 2 of the 3 that failed to produce fruit responded favorable at the onset. But receiving the word with joy and enthusiasm is not enough. Those who receive the Kingdom must receive the kingdom with a willing heart and a submissive mind. God does not drive us into the kingdom of God. God may plead, but he does not demand. He will persuade, but will not drive us into the Kingdom. The mystery of the Kingdom is that the Kingdom has come yet people can reject it. Many do. To be a disciple in the Kingdom means hearing and responding to the message of the kingdom in such a way your life becomes defined by it. This brings us to the final soil, the PRODUCTIVE soil. This soil is good, receptive and responsive. Jesus uses hyperbole and exaggeration to show the profound impact that the message of the Kingdom can have. In first century Israel, any ten-fold increase would have been recognized as a good crop. Yet Jesus speaks of fruitfulness that can measure thirty-fold, sixty-fold, or even one hundred-fold. The Kingdom comes when seed and soil come together. Kingdom begins to come in a person’s life when the soil receives the word. Any hearing that does not result in life change (transformation) is not valid hearing. Conversions that count are confirmed via our discipleship and our fruitfulness. This parable is designed to challenge us to see ourselves in the soil types. Which soil are you? Can you look at your life and see evidences of fruitfulness? If so, are you as fruitful as you can be? Tomorrow I’ll discuss how we can improve our soil in order to increase our fruitfulness in the Kingdom. We have a landscaping issue at our house. We have two spots in the flower bed in front of our home that literally won’t grow weeds. Usually the dirt around new construction is not the best, so we thought we needed to simply improve the soil. We did so by adding sand and peat moss, hoping these agents would help those big chunks of beige clay. No luck. Three years and about 4 yews later, we still can’t get the soil to produce lasting growth. The yews we planted to replace the yews we planted to replace the original yews are yellowing. The focal point of the series on the Kingdom of God concerns the parables of the present Kingdom found in Matthew 13. The first and perhaps most significant is the parable of the sower (Matthew 13:1-9; 18-23). The Kingdom is a Kingdom of the word, and the parable of the sower is a parable about how we receive the word. It’s interesting that our paragraph headings in our Bibles refer to it as a parable about a sower. But in reality it’s a parable about soil. According to Jesus, our hearts are like soil which receives the message of the Kingdom. Jesus came to announce that the Kingdom is here. But the Kingdom comes through persuasion rather than force. The Kingdom has indeed come, but not with irresistible power. It is like a farmer who sows seeds. Some receive it but many do not. The parable begins by describing a farmer (literally “the” farmer) who goes out to sow seeds. Clearly this happens during a time in history that did not include tractors and implements designed for sowing seed precisely in order to maximize yield. Farmers who were Jesus’ contemporaries more than likely used the broadcast method of sowing. They would reach their hand into a bag of seeds, and fling them across the ground. The farmer sowed purposefully. After all, the text states that he “went out to sow.” But he also sowed generously and indiscriminately. The farmer was caught up in target audiences so to speak. His job was to sow. The seed, Jesus described, is representative of the message of the Kingdom. This seed contains life, and when it accomplishes its intended purpose, produces fruit. In the parable the farmer and the seed are the same. The difference is the condition of the soil. 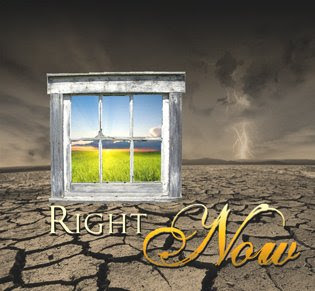 When our eyes are open to see, and our ears are open to hear, and our minds are attune to conceive and perceive, we are aware of the tangible reality of the present Kingdom of God right now in our midst. We find that Jesus is accessible today as a reality and not merely a historical character. We become aware of the work of the Kingdom in areas like justice, beauty, and sharing the gospel. To conclude, let me simply encourage you today by reminding you of the words of Paul in 1 Corinthians 15:58, “So, my dear brothers and sisters, be strong and immovable. Always work enthusiastically for the Lord, for you know that nothing you do for the Lord is ever useless” (NLT). In the present Kingdom all things matter and everything counts. Perhaps this is why Jesus placed high value on “cups of cold water” offered in his name. Your life in the Kingdom counts. It matters and is significant. When I began planning the Right Now series on the Kingdom of God, I did what I always do…I took a shopping trip to my favorite store, Amazon.com. When I searched the Amazon site for available resources regarding the Kingdom of God I discovered good news and bad news. The bad news first. I was appalled at the limited number of resources that were available on the subject at hand. Could it be possible that the core teaching of Jesus had been thoroughly neglected? “Maybe it was just Amazon.com,” I mused, and then quickly made my way to ChristianBookDistributors.com. “Blast! Same result!” I still shake my head in disbelief at the idea that nothing substantial was being published on this important subject. Now the good news. During my quest I came across a wonderful reference work on the parables of Jesus titled Stories with Intent by Klyne R. Snodgrass. Snodgrass serves as the Paul W. Brandel Professor of New Testament Studies at North Park Theological Seminary in Chicago. Stories with Intent is a comprehensive resource for serious Bible students who desire to learn about parables and how they functioned in the first century. Beside the biblical background support, Snodgrass provides hermeneutical assistance to help interpret the parables and arrive at an appropriate application for today. He concludes by making the case that the purpose of parables is to “awaken insight, stimulate the conscience, and move us to action.” In other words, Jesus taught in parables to cause us to think for ourselves and to respond with action. While the parables often call for specific moral action, they are more importantly calls issued to disciples to radically reorient their lives as participants in the Kingdom of God.